Having a parasite can be a scary thought. 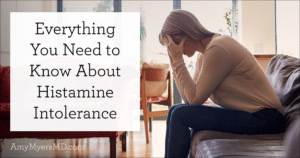 However, you are not alone — you’d be shocked at how often intestinal parasites are to blame for ongoing health issues, from digestive symptoms, to insomnia, to skin issues, and more. The idea that parasites only exist in underdeveloped countries is a myth. Truth be told, I see them in the majority of patients I treat, particularly my thyroid and autoimmune patients. And all too often these patients have tested negative for parasites using standard testing, yet come up positive on functional medicine tests. 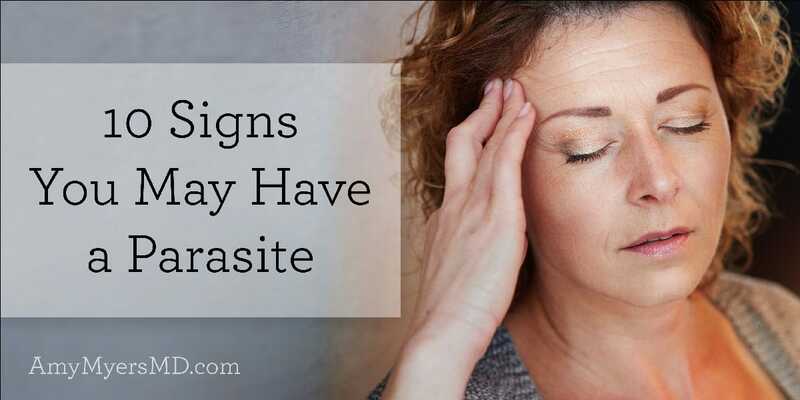 In this article I’ll share 10 signs that indicate you might have a parasite, and how to get the proper testing and treatment. Some examples of parasites include: roundworms, tapeworms, pinworms, whipworms, hookworms, and more. Because parasites come in so many different shapes and sizes, they can cause a very wide range of problems. Some consume your food, leaving you hungry after every meal and unable to gain weight. 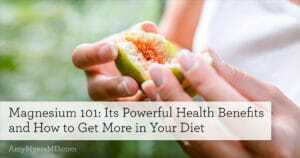 Others feed off of your red blood cells, causing anemia. Some lay eggs that can cause itching, irritability, and even insomnia. If you have tried countless approaches to repair your gut and relieve your symptoms without any success, a parasite could be the underlying cause for many of your unexplained and unresolved symptoms. There are a number of ways to contract a parasite. It’s true that contaminated water from underdeveloped countries is a common source of parasites. However, they are also frequently found in undercooked meat, unclean or contaminated fruits and vegetables, and lakes, ponds, or creeks. Some parasites can even enter the body by traveling through the bottom of your foot. Once a person is infected with a parasite, it is very easy to pass it along. If you have a parasite and do not wash your hands after using the restroom, you can easily pass microscopic parasite eggs onto anything you touch – the door handle, the salt shaker, your phone, or other people. It is also very easy to contract a parasite when handling animals. The signs of a parasite can often appear unrelated and unexplained. As I mentioned previously, there are MANY different types of parasites that we are exposed to in our environments. I typically see parasites causing more constipation in patients than diarrhea, however some parasites are capable of changing the fluid balance in your gut and causing diarrhea. Trouble sleeping, skin irritations, mood changes, and muscle pain can all be caused by the toxins that parasites release into the bloodstream. Often times, these toxins cause anxiety, which can manifest itself in different ways. For instance, waking up in the middle of the night or grinding your teeth in your sleep are signs that your body is experiencing anxiety while you rest. 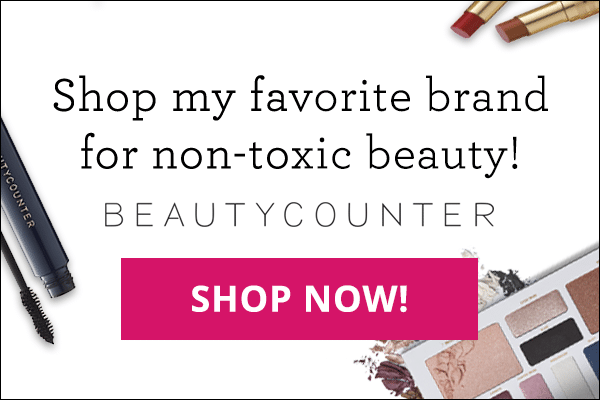 When these toxins interact with your neurotransmitters or blood cells, they can cause mood swings or skin irritation. As I mentioned, I often see parasites in my patients with thyroid dysfunction, particularly the two autoimmune thyroid conditions, Hashimoto’s and Graves’. 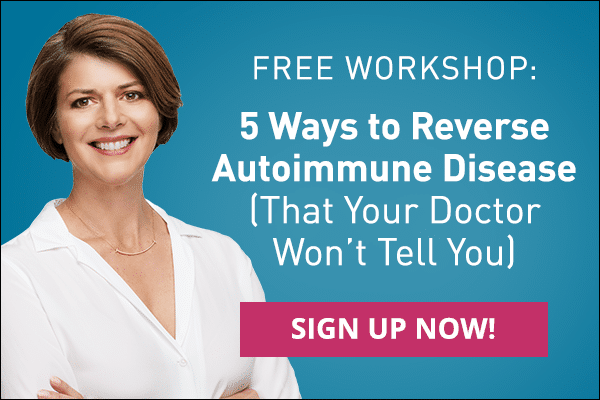 And this is no coincidence, as infections are one of the five potential root causes of all autoimmune disease. A potential trigger for both Hashimoto’s and Graves’ is toxoplasmosis, a disease caused by a parasite found in undercooked pork and infected cat feces. If you’ve been infected you might not have any symptoms or you may experience mild flu-like symptoms. For pregnant women, toxoplasmosis poses a risk to the fetus (which is why expecting mothers are advised to stay away from kitty litter). In most people, the parasite passes, though sometimes it can linger in your system, triggering Hashimoto’s or Graves. Blastocystis hominis is another parasite that has been linked to Hashimoto’s. It is common in developing countries, so if you’ve traveled to the developing world you may well have picked it up. The Centers for Disease Control says that this parasite doesn’t really cause any harm. However, I’ve seen case reports in which people are treated for this parasite and then their Hashimoto’s resolves. Because of this, I always recommend testing for (and if necessary, treating) parasites in my autoimmune thyroid patients. The theories behind how infections trigger autoimmunity are complex, and researchers are still trying to figure out the exact mechanisms. For a more in-depth look at the connection between infections and thyroid dysfunction, check out my book, The Thyroid Connection. While it’s true that parasites are often a root cause in autoimmune disease, there are certain instances in which parasites are actually helpful for treating autoimmunity. In fact, some Crohn’s treatments involve the introduction of certain parasitic worms called helminths into the gastrointestinal tract to reduce symptoms. Helminths, such as hookworms and whipworms, have anti-inflammatory and immune-modulating effects that have been shown to reduce symptoms of Crohn’s. Many researchers suspect this is because of the “hygiene hypothesis.” The idea is that the industrialized world is too clean, and that we are no longer exposed to the common pathogens that our immune systems used to encounter generations ago. There is a lot of exciting research emerging in this field, and it is something I have been digging into quite a bit over the last year (including trying helminth therapy myself!). I will be covering this in a future article, so if you haven’t already, be sure to subscribe to my weekly newsletter so you don’t miss it. Although parasites can be helpful for autoimmunity, they are typically harmful to your gut health and are often a trigger for autoimmunity, so I always recommend testing in order to determine which type of parasite you have. Most commonly, I recommend treating parasites in my patients. Conventional stool tests can identify parasites or parasite eggs in your stool, yet this test comes with many limitations. The problem with this test is that it is only conditionally successful. This test requires three separate stool samples that must be sent to the lab for a medical technologist to view under a microscope. Parasites have a very unique life cycle, where they can rotate between dormant and alive. In order to identify them in this conventional test, the stool sample must contain a live parasite, the parasite must remain alive as the sample ships to the lab, and the medical technologist must be able to see the live parasite swimming across the slide. While these can certainly be useful tests for some people, they are unable to identify dormant parasites and therefore I often see a high number of false negative tests with this type of stool test. In my practice, I use a comprehensive stool test on all of my patients. The comprehensive test is much more sensitive than the conventional stool test because it uses Polymerase Chain Reaction (PCR) technology to amplify the DNA of the parasite if there is one. This means that the parasite can actually be dead or in its dormant phase and it will be detected on this test. Because this test utilizes PCR technology it is not reliant on a pathologist seeing a live parasite swimming on the slide. I frequently diagnose parasites in my patients that were missed on conventional stool tests. If you suspect you may have a parasite and are interested in testing, my Wellness Coach and Registered Dietitian can help you determine if a parasite is likely, recommend testing if needed, and review your results with you. The comprehensive stool test is able to identify seventeen different parasites, so when I know which parasite my patient has I use prescription medications that target that species of parasite by attacking its central nervous system. If, however, the parasite cannot be identified, or you’re treating your parasite at home, I use Microb-Clear™, a blend of herbs, including magnesium caprylate, berberine, and extracts from tribulus, sweet wormwood, grapefruit , barberry, bearberry, and black walnut. Microb-Clear™ provides a broad spectrum of activity against the most common pathogens present in the human GI tract, while sparing the beneficial gut bacteria. While treating with Microb-Clear™, I also recommend taking 100 Billion Unit Probiotics in order to restore and maintain healthy levels of the good bacteria that keep infections in check, support a healthy immune system, and repair your gut. If you have a history of liver disease, heavy alcohol use or previous history of elevated liver enzymes, I recommend you consult your physician and have your liver enzymes checked before starting an anti-parasite herbal supplements. 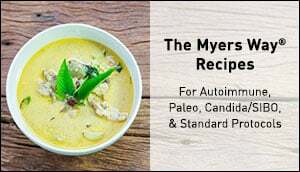 The Myers Way® Parasite Control Program outlines my method for overcoming gut infections, including parasites, in order to repair your leaky gut and achieve optimal health. My objective is to empower you to discover the root cause of your symptoms and be able to self-treat at home with food and supplements. Remember: the gut is the gateway to health, and maintaining a healthy gut is the first step in preventing and reversing chronic illness!